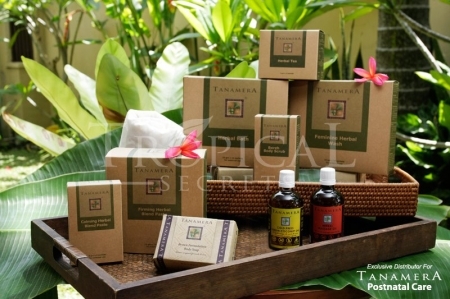 Formulated based on traditional Malay, Chinese and Ayurvedic postnatal treatments to provide a natural solution for new mother’s body to heal from the inside-out in a balanced manner, hormonally and physically. Made from plant-based 100% natural ingredients with emphasis on the use of tropical herbs and essential oils, with no artificial coloring, fragrance, preservative, toxic chemical nor ‘jamu’ which are harmful to babies. Designed to provide care during pregnancy to help prepare for smoother delivery, and care during confinement to help new mothers rest, recover and rejuvenate to prepregnancy body and shape, in the shortest time possible. Breastfeeding friendly and with aromatherapy effect to calm and soothe new mothers to faster recovery. The products’ ingredients are 100% natural to ensure safety for both Moms and Baby. The postnatal care set is made from high quality and fresh ingredients to make sure you get the best out of it. The normal retail price for each set is RM390 in Semenanjung Malaysia, and RM410 in Sabah/Sarawak, including postage. *For overseas clients, kindly e-mail us at admin@confinementcaremalaysia.com for pricing and postage. We are currently running a promotion till 31st January 2019 and the promotion price for the Set is RM365 Semenanjung , RM385 Sabah/Sarawak , postage included . Order NOW before the promotion ends on 31st January 2019 !! © 2019 Confinement Care Malaysia PLT (LLP0004263-LGN). All Rights Reserved.